An Icelandic company figures out how to make methanol from waste CO2, but the economics may not work without a nearby volcano. 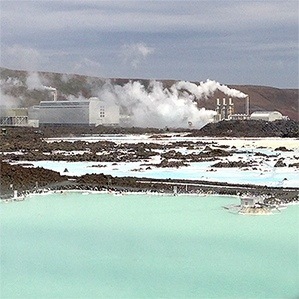 When a geothermal power plant started spewing hot water into the barren, volcanic landscape of Iceland’s Southern Peninsula in 1976, the locals turned the steaming lake into a health spa that’s now frequented by half a million people a year. Now a small Icelandic company is hoping to turn a profit from waste carbon dioxide from the same plant. Carbon Recycling International has built an adjacent plant that converts the carbon dioxide into methanol, a fuel and feedstock for making plywood, paints, and other products. It may be the first company anywhere to demonstrate a commercially viable way of making liquid fuel directly from carbon dioxide, something that could help reduce greenhouse gas emissions. So far, though, the economics work only in rare places that have cheap power and cheap carbon dioxide. For carbon dioxide recycling to make a big dent in greenhouse gas emissions, we’ll need breakthroughs in catalysis and almost certainly a tax on emissions of carbon dioxide to provide an incentive to capture and use it. In Iceland, industrial prices for electricity are only four cents per kilowatt-hour, roughly a third of what industry pays in Germany or in New England in the United States. The carbon dioxide emitted by the geothermal plant is also cheaper to capture than the carbon dioxide from fossil-fuel power plants. At coal-fired plants, carbon dioxide is a product of burning coal in air—the resulting flue gas, like air, is mostly nitrogen, and separating the carbon dioxide is expensive. Geothermal plants are powered by water heated by hot rocks underground, often those associated with volcanoes. Carbon Recycling brands its methanol Vulcanol, says CEO K-C Tran, because “it’s made with energy from a volcano.” Carbon dioxide is formed by the decomposition of underground carbonate rocks. The amount of carbon dioxide is relatively small—roughly one-20th as much as for coal-fired power plants per kilowatt-hour of electricity. But the geothermal plant emits highly concentrated streams of carbon dioxide that require less energy and equipment to separate and capture. To make methanol from carbon dioxide, you need a source of hydrogen, since methanol is partly made of hydrogen. Hydrogen is also a fuel in its own right and provides the chemical energy needed to form methanol. Carbon Recycling gets its hydrogen by using electricity from the geothermal power plant to split water. Tran says that the process will be profitable by next year, when its five-million-liter methanol plant is operating at full capacity. Entry filed under: energía, Energía renovable, geotermal, Medio Ambiente. Tags: energía volcánica. Nuevo Catalizador para la eliminación de Nitritos	Acuíferos de agua dulce ocultos bajo las plataformas continentales.